The Indian auto maker plans to assemble 2- and 4-door midsize pickup trucks from semi-knocked-down kits starting in 2009 at a new plant in Ohio. Mahindra & Mahindra Ltd. not only will be India’s first domestic manufacturer to sell vehicles in the U.S., but also the second auto maker in recent years to construct a modern-era vehicle-kit assembly plant here. Daimler AG (formerly DaimlerChrysler AG) began shipping knocked-down-kit versions of its Mercedes Sprinter commercial van to its Gaffney, SC, plant in 2001. However, the rebadged ’07 Dodge and Freightliner vehicles now are assembled at a specially built facility in Ladson, SC, that opened in March of last year. Mahindra, which has been producing tractors in the U.S. since 1994, plans to assemble 2- and 4-door light pickup trucks from semi-knocked-down kits starting in 2009 at a greenfield plant in Ohio. Diesel-hybrid models will follow in 2010. Sources tell Ward’s a number of U.S. suppliers have been contacted by Mahindra to build components for the Ohio plant. Some already furnish parts for tractors built at the truck maker’s U.S. headquarters in Tomball, TX. Mahindra’s strategy in building from kits, rather than exporting completed trucks from India, is designed to avoid the 25% U.S. “chicken tax” imposed since the 1960s on trucks imported from outside North America. The OEM says it is experienced in kit assembly, which is common among auto makers in India. But while the company reportedly plans to sell tens of thousands of units annually, it is entering the U.S. small-pickup sector at a time when most manufacturers may be on the verge of getting out. Volume plunged 16.2% in 2007, according to Ward’s data. Nevertheless, Mahindra’s lead importer executive for the U.S., John Perez, said at the National Automobile Dealers Assn. gathering in San Francisco earlier this month the company has signed about 200 franchised dealers to sell the pickup trucks, as well as completely built-up SUVs to be imported into the U.S.
Perez, a former new-car dealer in Atlanta, also told dealers the Indian company will be assisted in Ohio by a U.S. assembler, which he declined to identify except to say it is not one of the Detroit Three. Roma Balwani, Mahindra’s corporate communications vice-president, confirms Mahindra will export midsize Scorpio SUVs to the U.S. Both the trucks and SUVs will be equipped with German-built diesel engines, she says, with the hybrid diesels planned a year after the U.S. rollout. Mahindra sells about 20,000 Scorpios annually in India. Unlike some emerging-market vehicle manufacturers looking to expand into the U.S., Mahindra has a proven track record, having built tractors for 62 years. 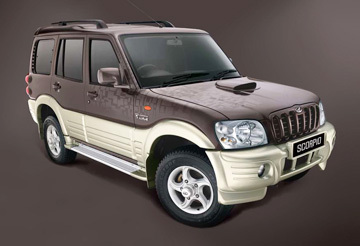 The company at one time had a joint venture with Ford Motor Co. to build utility vehicles in India, but ended the relationship to build its own range of SUVs. Most recently, Mahindra has been in talks to construct a $1 billion JV assembly plant with Renault SA to produce Renault models, as well as piggyback on Renault technology for production of a new 7-seat cross/utility vehicle. Another JV, Mahindra Renault Ltd., already makes the no-frills Renault Logan small car in India. The plant deal stalled when Mahindra became miffed over Renault/Nissan Motor Co Ltd.’s deal to make a $3,000 car with Bajaj Auto Ltd. and produce light-commercial vehicles with Ashok Leyland Ltd.
Mahindra reportedly also has been talking with Chrysler LLC about building SUVs for Asian markets. The Indian auto maker traces its roots to World War II classic Willys Jeep, after a contract to build the vehicles was awarded to founding brothers J.C. and K.C. Mahindra. Additionally, Mahindra reportedly has sent feelers to Ford India Ltd. to revive their earlier ill-fated JV. Meanwhile, the company is looking seriously at making commercial vehicles in India for export markets as part of a JV with U.S.-based International Truck and Engine Corp.
Mahindra reported gross revenues worldwide of about $6 billion last year and is the only tractor company to win the coveted Deming Prize for quality. It ranks fourth in U.S. tractor sales and third in global tractor production. The Indian auto maker employs about 50,000 workers worldwide, with manufacturing facilities also in Australia, China, Italy and South Africa. Mahindra owns Stokes Forgings in the U.K., plus German chassis-supplier Schoneweiss & Co. and Jeco Holding AG, one of Germany’s top-5 forging companies.